Sadly, the new tax laws have effectively killed the collector car exchange. 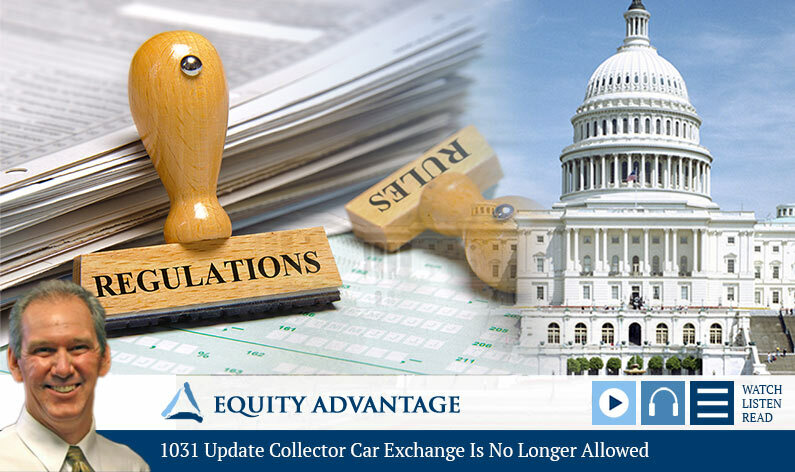 As more details emerge of changes to 1031 exchanges due to the new laws, David and his team will be sending out further updates to investors. Today we’re talking with David Moore, co-founder of Equity Advantage, a firm that specializes in tax deferred investment, in particular IRS Section 1031 exchanges. David, is the collector current exchange no longer available to investors? David Moore: Unfortunately it’s not. It’s something that I really enjoy doing, I’m a car guy, so I just had a great time working on those cars. We have some great clients in that world, but unfortunately it sort of snuck through quickly on us: the elimination of personal property. So what happened in Section 1031—in the code—when we’re talking about qualifying property, is they changed it from property to real property, which in one fatal swoop eliminated all the personal property transactions. So I’ve obviously been doing these exchanges for more than 26 years and enjoyed working on all aspects of them, but we’ve now lost the personal property component. Real property has actually been simplified a little bit. We’re talking about partnerships, but when we’re looking at the fun stuff that I like to play with, those unfortunately are gone. Are there alternatives you could suggest to investors? David Moore: Well, first thing I’d say is: talk to your tax people and, if they’re like my tax people, they’re basically saying it’s taking us a little while to get our feet under us with respect to what’s out there—what changes the Tax Reform Act has actually put in place. But it sounds like there’s the ability to fully expense an acquisition of a like kind asset, so although you’re going to be realizing a gain on disposition, there might be some other avenues with offsetting on full expensing of the acquisition. But as far as the time horizon of those things, what kind of window you’ve got to do that with the replacement, I’m not sure at this point. I’m sure the details are going to be forthcoming. Thank you, David. Listeners may call 503-635-1031 or can visit 1031Exchange.com for more information. As David noted, the experts are still analyzing the new laws and their impact on investors. A key part of Equity Advantage’s commitment to the investment community is to keep on top of everything that can affect their investment options, so be sure to check right here for further information. And remember, David’s best advice is to pick up the phone and give the experts a call!